The Darlingtonia Trail provides an opportunity for brief time travel into an otherworldly habitat. The length of this trail is just enough to give road weary legs a stretch while plant encounters of the highly unusual will stretch your imagination. The trail is really a little roadside stop which provides a showcase and home for a very unusual plant. 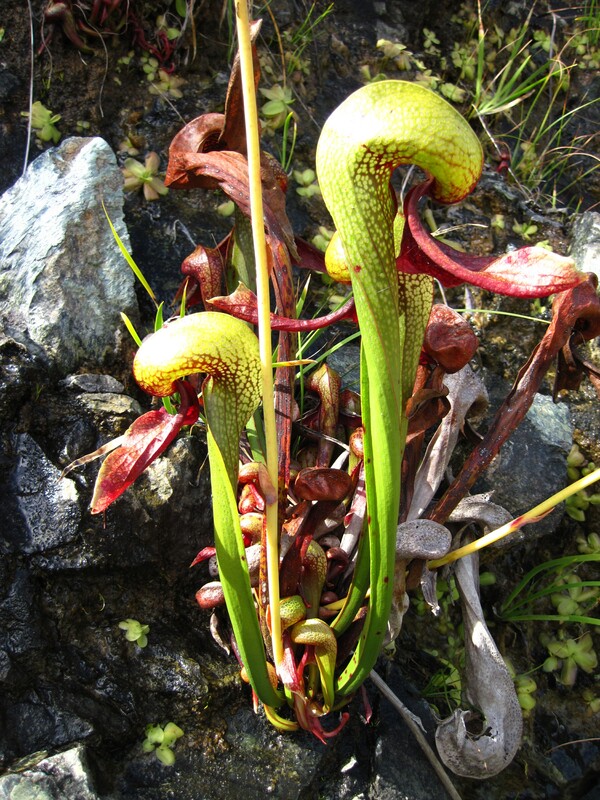 It goes by the names California pitcher plant, cobra lily or its scientific name of Darlingtonia californica. 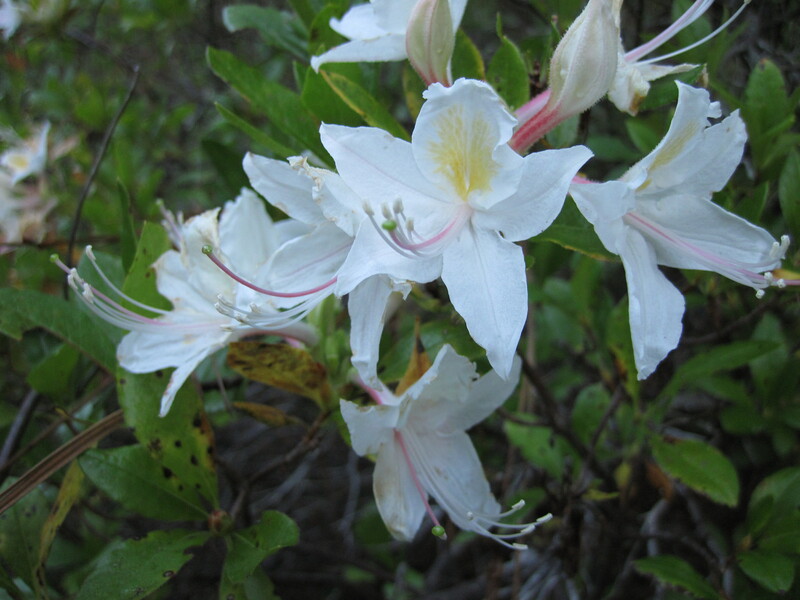 Setting off on the loop trail, interpretive signs will educate and delight you with the details about the trees and shrubs you are seeing along the path, including Incense Cedar, Douglas Fir, salal, evergreen huckleberry and in the right season sweet smelling western azaleas. Follow the rocky path built to keep hiker boots from trampling tender roots, and you will be led to small wooden overlooks to view the star of the show, the Darlingtonia bog. 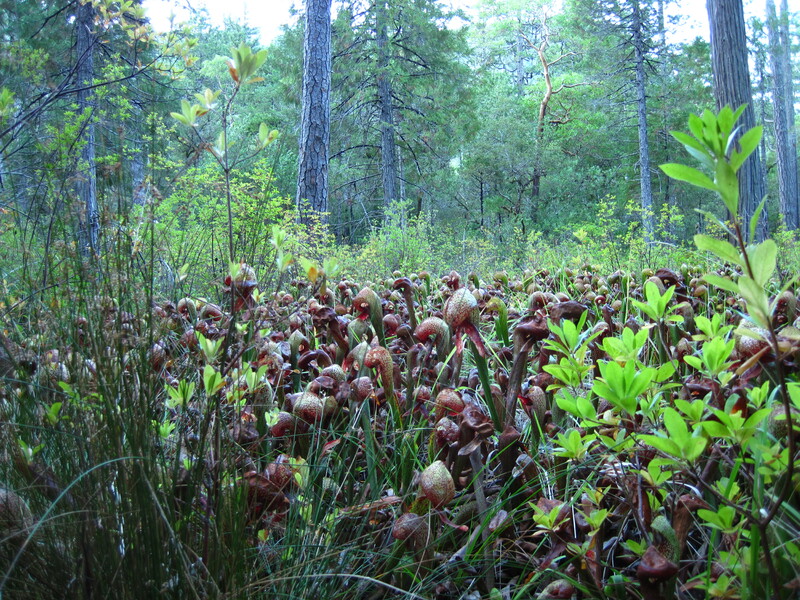 The uncommon Darlingtonia is a carnivorous plant restricted to growing in just a handful of places in Northern California and the Oregon coast where nutrient-poor serpentine soils create bogs or seeps with cold running water. The plant supplements its nitrogen requirements by passively trapping insects inside of its tall tube like leaf structure and breaking them down with a digestive enzyme. Insects fly in via a hole in the underside of the hood arching over the tube. They’re attracted by sweet nectar and can’t crawl out because of downward facing hairs along the inside of the tube. Insects that try to fly out are fooled by many false exits created by multiple translucent spots in the plant’s hood. Eventually they tire of the effort and fall into the digestive juices in the bottom of the tube. The unusual shape of the protrusions from the hood has been described as both a mustache and fangs-a strangely beautiful plant. Beginning in late spring and lasting into summer, its flowers grow tall as the pitchers are set out with a yellowish purple color. At first glance it’s difficult to determine if the flower and the pitcher are related. But close inspection will verify that they do indeed originate from the same root source. The roots also have an unusual adaptation; they enable the plants to regenerate after fire. This regeneration does not mean the roots are indestructible though, care should be taken to keep children and pets on the boardwalk and out of the bog. Don’t forget to look for the Jeffrey Pine near the bog. The trail is also the site of an abandoned open ‘test’ mine shaft which recalls the days when prospectors dug mole holes all over California looking for gold. Just as old time prospectors sought out serpentine rock formations because of the minerals they contained, today’s photographers and wildflower enthusiasts come to this serpentine environment to find its botanical treasures. Completing the loop trail takes you past the bogs and through California laurel, canyon live oak, ocean spray and manzanita back to the trail’s beginning.